Minute Maid Slushies are back at McDonald's restaurants in select areas for the 2018 summer. 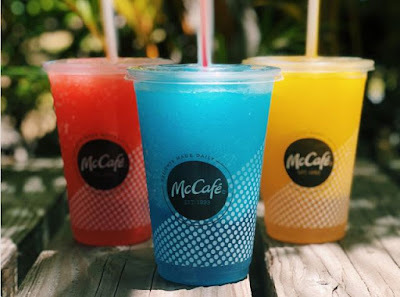 The slushies return in new Blue Raspberry and Tropic Twist flavors as well as returning Cherry Limeade. Markets where they've been spotted include Hawaii; Atlanta, GA; Northern Illinois; and Indianapolis, IN. Last summer, they were available in select areas in Fruit Punch, Cherry Limeade, and Orangeade flavors.